THE LIMOUSINE BUSINESS has never been shy about evolving with the times: first there was the white wedding limo, then the pink ladies' limo, the bulletproof presidential limo, the shag-carpeted limo, the stretch limo, and ultimately, the hot tub limo. Now, bringing fresh meaning to the concept of road warrior, there is the hummer limo. The promotional video for this civilian version of the oversized military vehicle that made its public debut during the Persian Gulf War, touts it as a "beast, slightly tamed." If that's the case, then LeGrande Affaire's Hummer limousine is a beast to be reckoned with. With its body stretched to 40 feet long, its roof raised six inches, this military-transport-turned-luxury-SUV seats 24 people with ease. A black leather interior contains two fully stocked bars, crystal decanters and bottles of champagne in buckets tumbling with ice. To complete the party atmosphere, Kenwood speakers thump out the tunes as tiny purple lights sparkle under a mirrored ceiling. There are two video screens, a fog machine and a plastic fireplace, crackling with fake fire. The Hummer was originally designed by the U.S. Army to navigate hazardous terrain. Better known as the "Humvee" among soldiers, the Hummer didn't hit the nonmilitary market until the early 1990s. Since then, Hummer manufacturer AM General Corp. of South Bend, Ind., has turned the 7,000-pound creatures over to civilians. When it comes to making a Hummer limousine, the machines are "stretched" in Los Angeles--where the original body is cut in half and a middle is added to bridge the gap. LeGrande Affaire, a leading Bay Area limo service, now has three hummer limos in their fleet which have been rented to everyone from visiting NBA allstars to a set of corporate house-hunters bound for Tracy. According to vice president Jason Restivo, the company has also shuttled the Sharks to Tahoe, taken Wyclef Jean of Fugees fame for a spin and packed in a group of strippers for a charity golf tournament sponsored by KSJO Radio DJs Lamont and Tonelli. For $365 an hour, the thrill is as affordable as a flight to New York, but remember to reserve in advance. Restivo says he once turned down former Warriors player Donyell Marshall, who wanted to pose inside for a photo, because his Hummers were completely booked. 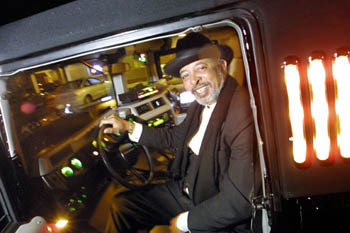 On the night this reporter decided to tag along, Willie Abraham, the chauffeur, cruised down Highway 87, on his way to whisk a birthday group off to Double D's sports bar in Los Gatos. Arriving to cackling whoops of "Jesus, look at that thing!" Abraham got out and opened the door for his riders, who had already started partying with Budweiser and bought a case along for the ride. As the revelers climbed in, the Hummer rocked back and forth. "This is too much!" one celebrant exclaimed with drunken glee as she slid into her seat. The limo's 24-person cache didn't make a dent it its acceleration--it remained sluggish but steady, with the engine roar of a tank. While most literature on the Hummer describes the vehicle's incredible, macho ability to handle the road, just coasting through the paved streets of Los Gatos was a thrill. The limo managed to transport an entire apartment full of folks and an evening's supply of alcohol with ease and incredible comfort. If, as one particular advertisement promises, driving a Hummer is like "a secret handshake into a world without limits," then Heather Murch, who hired the limo for her sister Trish's 30th birthday, had a firm grip. "I would for sure recommend it," she says in a coarse, energetic voice. While Murch says her crowd would have preferred 12-packs of brew to the champagne on board, she found riding in a Hummer limo a luxury she could readily get used to. "It was so much fun, I wish we could do it all the time," she says. From the March 29-April 4, 2001 issue of Metro, Silicon Valley's Weekly Newspaper.